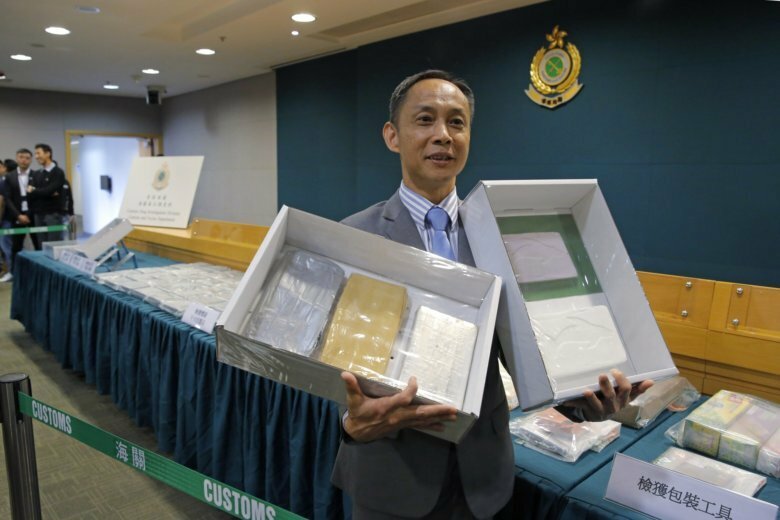 HONG KONG (AP) — Hong Kong customs agents have seized a massive haul of cocaine with an estimated street value of $13 million and arrested one suspect. The customs service in the semi-autonomy Chinese territory said the operation Wednesday that targeted a private residential apartment in the Shatin neighborhood netted 91 kilograms (200 pounds) of the drug — making it the single largest in terms of value and amount outside of the territory’s ports. Head of the Customs Drug Investigation Bureau Hui Wai-ming said the suspect, described as a “core member” of a drug syndicate, was stopped after leaving the apartment and 4 kilograms (9 pounds) of cocaine found in his bag. Agents then took him back to the apartment where the remainder of the cocaine was found. Hui said the 41-year-old suspect was a Hong Kong resident with connections to the territory’s organized crime groups known as triads. More arrests were possible in the case, he said. The syndicate had only been operating for about a month, Hui said. “They are not fully operational yet, therefore there isn’t a huge amount of drugs distributed to the market yet,” Hui told reporters at a news conference. The drugs were believed to have arrived by ship from South America, Hui said. The cocaine was in the form of bricks covered in a waterproof wrapping and stamped with a brand — either dolphin, horse or leaf. Meanwhile, Hong Kong’s large population of finance workers, lawyers and others in well-paid white collar sectors also provides a lucrative market for drugs including cocaine and marijuana. Hong Kong’s past is steeped in the drug trade, having been founded as a British colony in 1842 as a result of the First Opium War.